For the 8-bit version, see Toxic Pools. Toxic Caves is the first level of Sonic Spinball for the Mega Drive, leading on to Lava Powerhouse. 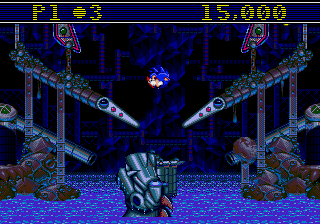 As with other stages in this game, Sonic must bounce through the pinball-like level, acquiring Chaos Emeralds which are in turn used to access the boss, Scorpius. In this stage, there are 3 gems to find. The level consists of two-mini boards along with a larger board that Sonic starts off in. Toxic Caves is a disgusting, slimy dungeon, filled to the brim (literally) with horrible green ooze which is all kinds o' deadly. The level encompasses the half-submerged caves at the foot of Mt. Mobius, where Sonic washes up after being blasted off the Tornado during his and Tails's approach to the Veg-O-Fortress. In keeping with Eggman's general ethos regarding environmentalism, the Fat Man is using the caves as a dumping ground for kilotonnes of radioactive slurry produced by the Fortress' cruel industry. Rusted sewer pipes snake through rocks dripping with florescent green pollution, and what slightly clean waters remain below are patrolled by an immense robotic sea-serpent. The background art in this level was repurposed from the foreground for Hidden Palace Zone, the infamous cut level from Sonic the Hedgehog 2. Both levels were designed by Craig Stitt. “ Explore the super polluted caverns of the Veg-O-Fortress, where Dr. Robotnik dumps industrial waste. A wrong move here could mean being smothered in green slime, or - worse yet - chomped by a Rexxon! Sonic Spinball page at The GHZ has detailed information on all the Sonic Spinball zones. This page was last edited on 9 October 2018, at 13:21.